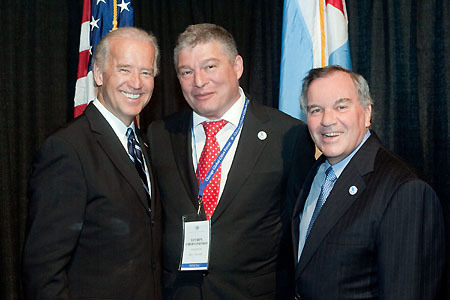 Vice Mayor Yevhen Chervonenko of Kyiv, Ukraine, joins United States Vice President Joseph Biden and Chicago Mayor Richard M. Daley at the Richard J. Daley Forum on Monday, April 27 held at the University of Illinois at Chicago, 725 W. Roosevelt Road to discuss the vital role cities will play in a successful recovery from today’s global economic crisis. The fifth annual Richard J. Daley Forum, titled “Global Economic Recovery: Cities Lead the Way” included a discussion focused on the impact of national stimulus plans, regional and local initiatives on urban areas. The Forum has served as a venue for the global exploration of strategies and kicks off The Chicago Global Cities Forum, hosted by Mayor Daley and Chicago Sister Cities International in which nearly 30 mayors and municipal leaders from around the world have come together to discuss critical urban issues, economic challenges and share innovative solutions. Chicago, IL  On Monday, April 27, 2009, Mayor Richard M. Daley and Chicago Sister Cities International welcomed mayors and municipal leaders from around the world for the first-ever Chicago Global Cities Forum, held at the University of Illinois-Chicago's Conference Center (April 27-29). The 2009 Forum opened with the Richard J. Daley Urban Forum, a public event, and was followed by two days of private discussion focused on pathways to economic recovery, urban planning and human capital initiatives. During this three-day summit, visiting municipal leaders presented their city's own innovative strategies and exchanged ideas and "best practices" on a number of topics. Nearly 30 mayors and municipal leaders attended the Forum including those from Moscow, Paris, Dubai, Bangkok, Beijing, Bogota, Reykjavik, Athens and Prague. "As mayors and leaders of municipal government, we share the same challenges. To secure our individual city's economic futures, we must remain committed to fully participating in the global economy and continue to overcome those challenges which have become greater in recent months," Daley said. "The world has shifted from a collection of regional or national economies to a truly global economy. The future well-being of cities depends on how we plan for and deal with global inter-connection. We must make cultural connections and expand our working relationships with global partners," he said. Other Forum highlights included visits by the mayors to Chicago institutions, including the the Field Museum, the Chicago Mercantile Exchange trading floor and the Chicago Office of Emergency Management and Communications. The conference agenda focused on three major topics: Global Economic Recovery, Human Capital and Urban Planning. "The Forum will give mayors a chance to hear from experts and share innovations on these three critical issues," Daley said. Vice President Joe Biden delivered the keynote address at the Richard J. Daley Urban Forum. The session focused on the critical role that cities are playing not only in recovering from the global economic crisis, but also in generating and sustaining long-term growth once the crisis has ebbed. The strength of a city and its ability to prosper are often dependent on the opportunities it can offer to residents in areas of education, jobs, social services and other similar factors. This session highlighted examples of innovative "human capital" investments that municipal leaders are implementing to help improve the lives of their residents, and in turn, to enhance the long-term prospects for their cities. This session underscored innovative initiatives that municipal leaders are implementing to successfully address urban planning, urban design, and energy and environmental challenges in their cities, and highlighted new approaches that municipal leaders are taking to help finance these initiatives.